A man leaps into center stage. He’s dressed in a bunny suit, with a large cardboard mask with long droopy ears, whiskers and buckteeth. He postures and threatens an invisible person placed somewhere out in the audience: The rabbit will haunt them, lurking in the shadows, for ever. So begins Berkeley Rep’s new play by Daniel Handler, more often known by his pen name Lemony Snicket, the author of the best selling children’s books, A Series of Unfortunate Events. Imaginary Comforts: or, The Story of the Ghost of the Dead Rabbit opened at the Rep’s Peet’s Theater this past Friday in its world premiere. 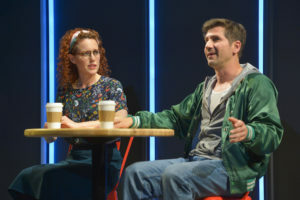 Though laced with the same droll humor that characterizes Unfortunate Events, the play is adult fare and comprised of a series of short scenes that reveal the absurdity of human lives, full of yearning and misunderstanding, pain and resolution. Even so, laughter is the pulsing heart behind the play’s sorrows – laugh-out-loud, bold laughter. Marilee Talkington (Naomi) and Michael Goorjian (Clovis) in “Imaginary Comforts, or The Story of the Ghost of the Dead Rabbit” at Berkeley Rep. Photo courtesy of Kevin Berne/ Berkeley Repertory Theatre. A storyteller’s play, Imaginary Comforts revolves around a tale that is part folktale, part gothic fantasy. In it, a man and his wife (who live, of course, at the edge of a forest) lament that they have no children. The man travels into the forest where he finds a rabbit, and he shares his grief with the sympathetic furry creature. The rabbit, who has many hundreds of bunny children, gives him his sweetest and most tender baby. In exchange the man must protect the rabbit and his family during the hard winter. The bunny transforms into a real-live human child. But, as in all good fairy tales, the doctor fails to meet his part of the bargain, horribly, grotesquely. The rabbit returns to haunt him. What is important, however, is not the tale itself, but how the seven individuals in the play understand that story and what it means to them. The tale moves sturdily along, entwining everyone in a larger more complicated set of stories, each built of a character’s life. There are also many stories created by the interactions of everyday life. In the play’s short episodes, which move backwards and forwards in time, revelations are made and … well, new stories of rabbits, some with long ears and some with short ears, are revealed. At the play’s opening, Clovis is directing an actor in his version of the rabbit tale. Clovis is wonderfully acted by Michael Goorjian, who conveys a kind of casual ease on stage. You never have the sense he is acting. He is just a guy, young, a bit clueless, sincere and inexperienced. The actor playing the ghost of the rabbit, Danny Scheie, is also sincere, investing the character with eagerness in his efforts to help Clovis make his play the best it can be. There is more going on here than meets the eye, at least for one character. In the second scene Clovis meets a girl in a coffeehouse through an online dating service. Naomi, played gracefully by redheaded Marilee Talkington, is a rabbi but, sadly, not a very good one. She too is clueless and inexperienced – a tangle of self-doubts. In the course of their coffee, she finds out that Clovis thought she was a rabbit, not a rabbi. Who could imagine? Their date is a failure. But as Clovis points out, now they both have a story to tell about how horrible their first date was. Next scene Naomi is at the coffeehouse meeting Sarah, played by an ironic Susan Lynskey, who hires Naomi to officiate the memorial for her recently dead father, Dr. Marcus Gold (Julian López-Morillas). Then they are at the Golds’ home, where Naomi bumbles her way through everyone’s feelings in her search for a story that reveals Dr. Gold’s life and character. Sharon Lockwood plays the speechless, blubbering Mrs. Gold and Jarion Monroe, their ineffectual family friend, Jack. There’s also Sarah’s husband Michael (Cassidy Brown), dropped by accident, it seems, into the family’s grief. It’s a merry-go-round of emotions and encounters. Artistic Director Tony Taccone directs, and the action is crisply rendered, beautifully staged and exquisitely timed. The revolving stages of the theater are perfect for the episodic play, allowing the actors to change scenes, players and moments seamlessly. Todd Rosenthal’s pared-back stage design eases the shifting scenes. Theater is an excellent medium for Handler’s talents, and Berkeley Rep has produced a performance that hops around ecstatically, brushing against existential sorrows while it entertains, delights and is just plain fun. Imaginary Comforts: or, The Story of the Ghost of the Dead Rabbit continues at Berkeley Rep’s Peet’s Theater until November 19. For tickets and information, visit berkeleyrep.org.